From my window seat on the Air Tahiti Nui jet the sails of the Sydney Opera House seemed poised to streak across the bay. White foam trails against the blue water were the first clue I had about the water's importance to Australia’s premier city. The pictures Sydney painted as I spent the next several days exploring were works of art. Sydney is a Cinderella city, from convict camp to queen of the prom. Not the stuffy queen but the one who uses her charms to beguile the unworthy heart. I was very glad I didn’t skip this dance. Truth is I fell in love with Sydney at first sight two years ago, during a four-hour layover heading to the Outback and a trip on the Ghan Railway. Deep in my heart I knew I would return, love at first sight is undeniable sometimes. It seemed fair to begin renewing my brief relationship with the city just where it ended, on the Rocks. The Rocks is where Sydney’s European roots were planted and remain. The Union Jack was raised in 1788 and Captain Arthur Phillip choose well, a point that took centuries to realize. It was on the Rocks that convicts and their overlords overcame the odds of creating a city that nowadays seems relaxed, cosmopolitan and healthy. The streets of the Rocks are narrow and 18th century buildings have undergone a facelift. The Sydney Harbor Bridge and Opera House anchor the Circular Quay, now the place to catch ferries to Sydney’s ever-growing girth. On weekends the Rocks Market spreads down George Street where booths filled with crafts and street music provide a back drop to the magnificent views. As I looked down from the Argyle Terrace it wasn’t hard to understand why locals love their city. To myself and just about every visitor to Sydney, the Rocks remains the first spot to begin exploring Oz splendor. Part of my love of the Observatory Hotel, aside from its sandstone prominence yet low-key setting, was the lack of tourists; after all I was back to court the prom queen of cities. It isn’t high-rise or ostentatious, just plain fabulous. 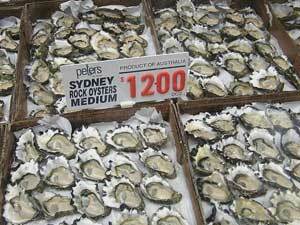 Oysters are a local specialty. Its dining room, Galileo, was fun and fantastic. It was built from a row of buildings that developed over Sydney’s rise in prosperity. Across the street were some homes to the Rock’s residents. Perhaps it was a blend of the Sydney attitude, cool but welcoming, that captured me. Over my stay returning to the Observatory was like getting to my home. After dining at great eateries I often headed down the street from the Observatory Hotel to raise a pint at the Lord Nelson Brewery with the locals. After a few visits I was shown the trap door in the pub where unsuspecting sailors were deposited after a night of landfall imbibing. The term, “Shanghaied” began beneath the old floor boards — many a sailor was well on his way to China before realizing it. Much of Sydney’s hidden history is revealed by lifting an elbow with a smile. As I walked through the underwater tubes at the Sydney Aquarium, monsters swam by seemingly smiling with big teeth. Sharks and crocs are very active during feeding at the Aquarium. With more than 11,500 creatures chowing down, I felt a little revenge was in order, so I headed to the nearby Fisherman’s Market, a perfect place to realize how little we Yanks know about seafood. 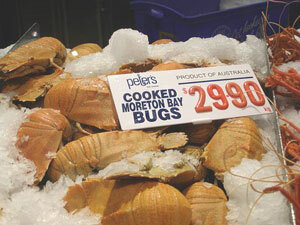 So are Moreton Bay bugs. Australia has had more than six hundred species caught in her waters. The market is part port, part auction house and part great dinning. There is even a seafood cooking school on the premises where 10,000 visitors a year take a quickie course. Unlike other fish markets I have explored, this one positively sparks up an appetite. Never have such strange names looked so delicious. Top on my list of edibles were Sydney Harbor oysters, yabbies and Moreton Bay bugs; the latter two are lobster-like creatures. Sated and satisfied I headed to the back of the Darling Harbor area and to the Australian National Maritime Museum to continue with my sea-themed day. The Museum’s façade, designed by Phillip Cox, reminds one of the sails of a ship. It seemed fitting to begin in the Merana Eora Nora Hall, translated from the aboriginal Darug language and the people that once populated the very area where the Museum now stands. Coverage from that early time through the arrival of the Europeans and into modern maritime topics filled my afternoon. Sitting at Nick’s Bar & Grill on King Street Wharf as the sun set was a lesson on just how the people of Sydney like to strut their stuff, glowing sky and happy people at peace with themselves and the world. Across the harbor the sails of the replica of Captain Cook’s Endeavor blended with the surrounding lights from across the water. 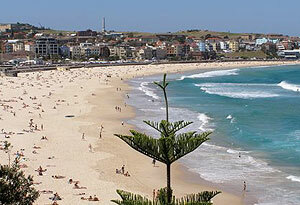 Beaches are an Australian obsession and Bondi Beach is the queen bee. As I sat at the well known Icebergs Restaurant, my view was of a wide crescent of golden sand, and scores of surfers bobbed waiting for the perfect wave. As I waited for the perfect lunch I was entertained by my friendly waiter. “Special, isn’t it?” he said. “Spot on,” I replied. Impressed by my use of Aussie slang he brought me a cold glass of South Wales Chardonnay on the house. Even at one of Sydney’s premier restaurants, levels of pretension are non-existent, a particularly wonderful Sydney attitude. After lunch I strolled the area filled with seafront cafes, shops and small hotels. Bondi in general is a lived-in area and not just a tourist beach. In a place so well known it was nice to see that prices weren’t jacked up and dressed up for visitors. Locals walk relaxed and many tote their boards. Trails around the headlands provided stunning views of the sea, but my time was running out because I was scheduled to ship out. 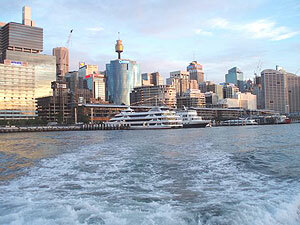 As soon as I boarded the Hunter 38 I knew that I was going to see Sydney the way it should be seen, at water level. Captain Matt Hayes from Sydney By Sail has sailing in his bones, his roots stretch back from the First Fleeter, those Brits who first arrived in Sydney. He was quick to note that it was not as convicts but as sailors. Matt has maintained family tradition well; he represented Australia in the Olympics in Atlanta. As the wind took us under the Sydney Harbour Bridge and past the Opera House, I had the opportunity to become one of the crew, an honorary First Fleeter, something I had to tell the mates back at the Lord Nelson Pub that night. It was, however, under the under the sails of the Sydney Opera House that I truly felt first rate. I arrived early the next morning for a backstage tour of Sydney’s icon. With six venues and more than 2,500 events and performances a year it is amazing that access such as I had is allowed. Despite the backstage passes strung around my neck I must confess that the chance is open to all visitors — but reserve early, groups are kept small. On my last day in Sydney I wanted to spend it outdoors as much as possible, much as the residents do. Walking through the Botanic Gardens seems a world away from the city center yet is only a few blocks. Throughout are reminders of Sydney’s European roots; indeed this was where the first vegetable gardens worked by convicts were situated. Today the trails pass extensive stands of native and exotic flora along 73 acres of harbor coastline. Most interesting was the National Herbarium, where species collected by Joseph Banks from Captain Cook’s 1770 voyage along Australia’s east coast are tended. The Gardens are proof positive that the best things in life are free. In a city that has scaled culinary mountains, I needed in some way to eat well and yet have my last perfect view; in Sydney, no problem mate. Below my porch table swimmers were doing laps, past the training pool, the Sydney Harbor Bridge and Opera House lights slowly stood against faded sunlight. Aquadining Restaurant on the North Side was just amazing, great food, wine and spirits and a perfect place to view the prom queen. 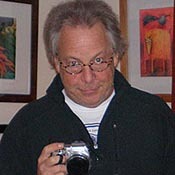 If I learned anything about my date with Sydney it was this, I want to once again hook up. 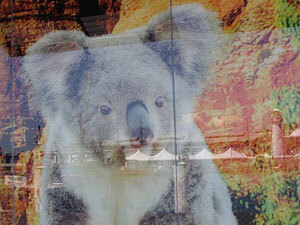 How much is that koala in the window? After learning about Air Tahiti Nui flying from NYC to Sydney, I checked out their reputation on Skytrax Web site. Their great reviews, adding on the chance to layover in Tahiti, made it an easy choice. I found myself very happy with my decision, excellent seats, entertainment and food made a long flight seem a lot shorter. Check out flights and schedules. 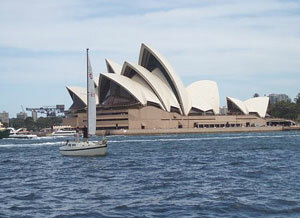 The first place to begin a visit to Sydney is at the comprehensive New South Wales tourism site. Whether it is attractions, events or practical information the site has it all. The Observatory Hotel was just perfect for my date with Sydney, classy, private and good looking. Its spa is divine and Galileo’s restaurant superb, everything you would expect for a member of Orient Express. 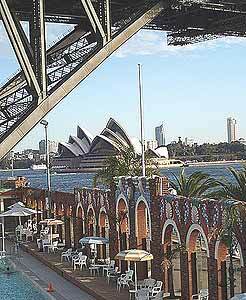 For more options, find unique Sydney hotels and interesting Sydney tours online. So many see the famed Sydney Opera House from outside, get behind the scenes and see what others don’t. 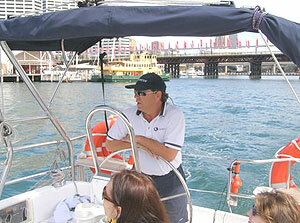 Sailing Sydney Harbor is an unbeatable outing that will enhance your Sydney experience. In a city filled with pleasurable dining it is hard to decide just where to go. Here are two of my favorites.